I can hardly believe that 2013 is almost over. It feels like it was yesterday when I was wondering what 2013 was going to bring. Now I am looking forward to 2014, which I have a really good feeling about for some reason. Of course, I am also thinking about all the things that happened this year. This is a good opportunity for me to list the top five most popular posts on this blog, based on page views. 1# Are you writing a story or building a world? Because this is the last time I’ll be online for the year, I’d like to wish all of my blog readers a Happy New Year, good luck in whatever resolutions y’all are making, and thank y’all for reading this blog. I hope this blog will get even more popular as the New Year rolls in. In this week’s Sunday Meme Thread, Batman is clearly not a Miley Cyrus fan. One of my most popular blog posts is called “Handling Criticism” (it has a whopping ten likes, which I’m pretty certain makes me a bigshot blogger now). In it, I wrote about the importance of learning how to handle criticism — both the constructive and destructive kind — in a professional, respectful way. Most writers will tell you they are okay with criticism, yet I’ve seen how defensive writers can get over their work when anyone dares to criticize it. I’ve been thinking about that bit for a while now. Why do we writers get so defensive over our works? Sure, it’s no fun when someone tells us that something we made isn’t perfect, but it is astonishing how defensive writers can get over our creations. Amateur writers tend to be the most defensive due to their lack of experience in responding to critics and editors, but I have seen some professional writers who should know better act this way, too, seemingly for no reason other than that their feelings were hurt. It is illogical when you think about it. Our works are not us. Yes, they were made by us and yes we put a lot of work and effort into them (usually), but again, they are not us. My stories are not me. They are a part of me, yes, but just because someone criticizes one of my stories does not mean they are criticizing me as a person. I think most writers would agree with that. Then why do so many writers get their pants in a twist when someone criticizes their work? Even if the criticism is fair and true? In my opinion, most writers are actually very sensitive people. That may seem an odd conclusion to come to. In a profession where rejection is commonplace and most consumers are more than happy to write and post online a scathing review of a story they didn’t like, you’d think the most sensitive writers would have been weeded out a long time ago. Surely only the toughest of the tough would still be in the biz, right? Maybe that’s true for some, but I think most writers who are still in the business have designed ways of coping with their sensitivity that make them look tough. They put on a mask of cold indifference or perhaps respectful politeness, even though deep down they would rather lash out in anger or cry. They know — sometimes from trial and error, sometimes from observing how other writers are treated for acting defensively — the price of oversensitivity in the writing business and so have come up with ways to cope with their sensitivity so it doesn’t destroy their careers. I myself am a sensitive person. I was a lot worse when I was a kid, but I am still quite sensitive. Whenever I get harsh criticism for my writing, I usually want to break down and cry or sometimes lash out in anger. As my “Handling Criticism” post shows, however, I’ve came up with constructive ways to handle my feelings, although as far as I can tell, my sensitivity is probably going to be with me for the rest of my life, whether I like it or not. Sensitivity isn’t a bad thing. Like everything in life, it has a good side and a bad side. I believe my sensitivity has made me more aware of life’s subtleties than most people are, which is a valuable gift for any writer to have. It usually keeps me from shipping out any work that is not yet ready to be read by anyone other than myself. As long as you have a constructive way to cope with your sensitivity, I think you’ll do just fine in the writing business. Do you think most writers are sensitive? Why or why not? If you are a sensitive creative person, how have you learned to handle your sensitivity when it comes to receiving criticism from other people? Christmas has come and gone (too quickly, in my opinion) and New Year’s Day is less than a week away. Most people — perhaps even some of you who are reading this right now — will be making resolutions for the New Year. How many of these we will actually follow through with varies; nonetheless, New Year’s resolutions are a part of our culture for better or for worse. Nonetheless, this year I have decided to make one New Year’s resolution. I decided to make it only one because it is a pretty big one and I don’t want to distract myself with other resolutions, especially because this particular resolution has been a dream of mine for a while now. To publish my first novel. Yes, that’s it. To publish my first novel. Nothing too fancy or crazy. It’s pretty ordinary if you think about it. Especially with the ease of self-publishing nowadays, making it so that almost anyone — whether they can write well or not — can publish a novel. Still, I have realized that in order to make bigger steps in my writing career, I will need to publish a novel. I will probably self-publish it, ’cause that seems to be the way to go right now, although I have been looking into small presses, too. However I choose to go about publishing it, I will publish it. This will be my year, the year where I take a large step forward in my writing career. I hope all of my blog readers will be with me as I get the novel ready for publication. I do not have a release date for it yet, but I can assure you it will come out next year. And I know it will be awesome. What do you think of New Year’s resolutions? Did you make some for 2014? How did 2013’s resolutions work out, if you made any? I just wanted to wish Merry Christmas to all of my blog readers. I am not going to be online today in order to spend time with my family, as well as enjoy my Christmas present, heh. I hope those of you who celebrate Christmas take the time to do the same. I set this post to post itself automatically today. It’s a feature I’ve never used before, but one I might use more often next year if I like it. Cristian Mihai shares some very good thoughts on art and having dreams. On cold and dark night of December I wrote my first story. It was for the first time that I had the vision, that my eyes saw more than what was right there, in front of me, that my ears heard more, and my mouth wanted to speak in a voice that was louder than ever before. I wanted to reach people, I wanted to share with them the same dream I had. It was happiness in a way that you know it can only last for a few moments, that kind of happiness you could never expect to last longer. I was happy because I knew what I wanted to do for the rest of my life. Hey, guys. Last month I participated in No Shave November, during which I grew a moustache. While I think it looks okay, I want to know if any of my readers have suggestions for moustache care. It’s not a particularly thick moustache at all, but as I have never had a moustache before I know little about moustache care. Also, if anyone knows any good resources on moustache care, I’m willing to check them out. In this week’s Sunday Meme Thread, Slowpoke is a bit late in discovering Psy’s new single, as usual. I am a firm believer that the best way to learn how to write is by writing. You could read all the books on writing in the world, but if you never put any of it into practice, then you will never know for sure what and what doesn’t work for you. Nonetheless, books on writing have been a huge help to and influence on me. They have taught me new ideas and new techniques. Sometimes I like to reread them when I feel lost, when I don’t know what to write, or when I don’t like what I am writing. In that sense, the books — or rather, their authors — are some of my writing mentors. So I thought I’d share a few of my favorite books on writing. I’ve read quite a few books on writing over the years, but these three are the ones that resonate the most with me. I highly suggest any writer, whether a beginner just starting out or a veteran who has been scribbling for years, to buy these or at least check ’em out from your local library anyway. 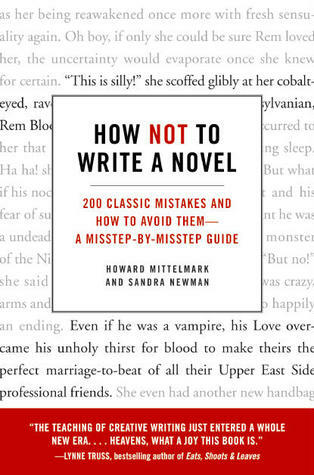 Drawing on 30 years of combined teaching, writing, and reviewing experience, authors Howard Mittelmark and Sandra Newman point out 200 mistakes most unpublished writers make, mistakes that often result in their manuscripts being rejected by agents and editors. While sometimes the snark can be a little annoying at times, it is has nonetheless entertained me many times with its irreverent humor. In particular, I enjoy how they illustrate every advice with examples, which make it easier to grasp the concepts they’re talking about. It does use a lot of adult language, however. While that doesn’t bother me personally, if you do not like that kind of language, then you probably shouldn’t read this book. But if you are willing to look past the language, then I think you will learn a lot of useful things to avoid in your writing. This writing book is unique among writing books because it is co-written by an author and her agent, thus dividing the book into two parts. The first half is written by novelist Laura Whitcomb, author of A Certain Slant of Light, which teaches the mechanics and craft of writing. It’s my favorite half of the book because it has so much useful information for all writers looking to improve their craft. The second half is written by author agent Ann Rittenberg. 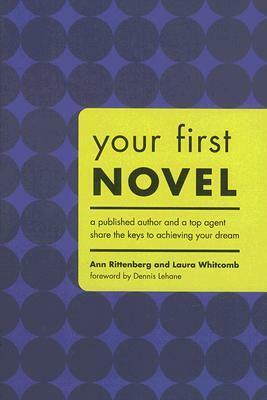 In this section, she teaches you how to get your novel published. It mostly covers traditional publishing (this book was published prior to the rise of self-publishing), but it is still useful. In particular, I loved the excerpts of bad query letters she shared as an example of how not to write a query letter. As a result of these two halves, the book is a different experience from reading other books on writing. I know of no other book on writing co-written by an author and her agent, which is a shame because I think it’s a really neat idea. 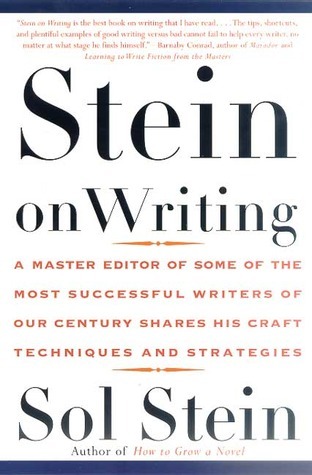 In this book, author and editor Sol Stein gives a lot of excellent advice for both fiction and nonfiction writers. It’s one of the few books on writing I own or know of that covers fiction and nonfiction equally, which is why I consider it valuable. Not only does it contain useful writing advice, but it itself is well written. It’s easy to read and follow along. And like How Not to Write a Novel above, Stein will sometimes use excerpts to illustrate the points he is trying to make. They’re generally from his own work. I have read other books on writing (and there are still quite a few I haven’t read but want to read), but these three are some of my favorites that I like to reread again and again, learning something new from them each time. I imagine that I will probably always reread them. Do you know any good books on writing? Share them in the comments! One thing of my personal goals is to see the world as clearly as I possibly can. It’s not possible to view the world objectively, of course. I have too much baggage — prejudices, biases, beliefs, and cultural conditioning — to claim that I can do that. Still, it’s always possible to see the world more clearly. Seeing the world clearly requires challenging our prejudices, biases, beliefs, and cultural conditioning. It requires the ability to say, “I am wrong.” More importantly, it requires changing our beliefs and behavior when proven wrong. How does writing tie into this? Good writing challenges us. It makes us rethink how we view ourselves and the world. In good writing — whether fiction, nonfiction, poetry, or some other form — we are forced to look at things through a point of view that is different from our own, sometimes radically so, and when we finish reading it, we can’t just go back to looking at the world the same way we did before. Even if we disagree with it, it nonetheless changes how we view the world, if only in subtle ways. Reading good writing is a powerful experience, but I believe it is more important to write something powerful. When I write, it is primarily for myself, even if I plan to show it to other people. I usually don’t know what I may learn from any given project. My writing is the teacher and I am the student, in other words. Even a simple short story can teach me something new or profound. When I write, I try not to let my baggage influence the story’s direction. During the editing phase, I will think deeply about the story’s plot and pacing and will make changes as necessary, but during the writing phase, I try to keep my influence on the story and characters to a bare minimum. Thus, by taking a mostly hands-off approach to writing, I end up with what I believe is a more honest story. It will not always confirm my own beliefs and prejudices. But it will help me see the world more clearly. This is why I write. This is why I will always write.